This app is for AT&T landline voicemail, not mobile phone voicemail. 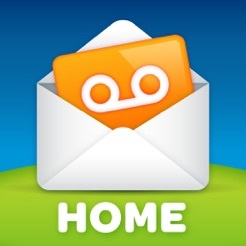 Make sure you have your AT&T home voicemail PIN prior to downloading this app. 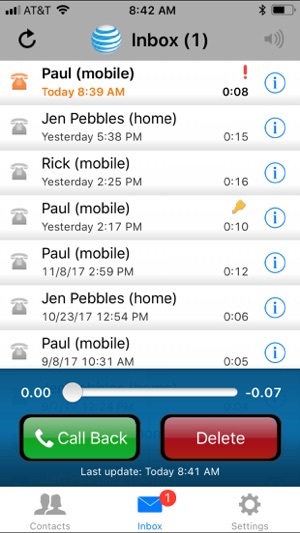 Voicemail Viewer makes it easier to stay on top of your Voicemail or Unified Messaging voicemail messages directly from your iOS device. 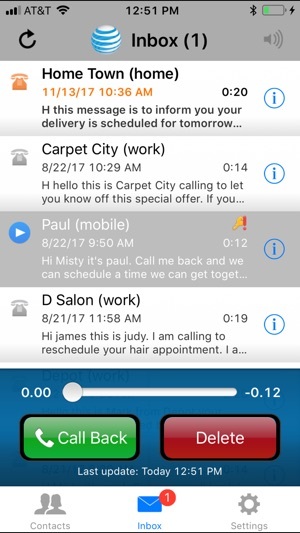 Like looking at messages in your email inbox, you can check your AT&T Voicemail messages visually, choosing the order in which you listen to them or even reading your messages as voicemail-to-text. For more information, visit our web site at att.com/vmviewer. If you are a Voicemail or an Unified Messaging customer and are having trouble signing into or using this app, please contact us at 800.288.2020 (Voicemail) or 888.300.6500 (Unified Messaging) and be prepared to provide your landline phone number associated with your mailbox, the device you are using to access the app and the problem that you are experiencing. Had this on my phone worked great. Lost my phone and got a replacement phone voicemail stopped working. Support (Ben) spent quite awhile working to get it working again and succeeded. A few days later voicemail stopped again. Support tried again but we couldn’t get it to work. Contacted AT & T spent over 1 1/2 hrs and two techs finally got it working. 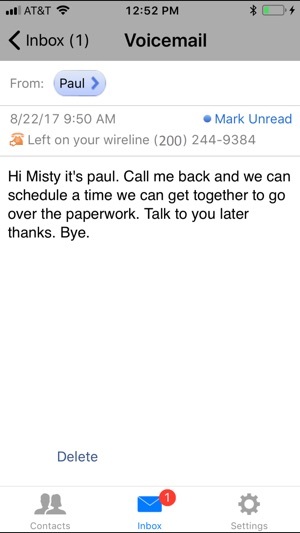 Was a phone problem and not Virtual Voicemail program. Working great again ! This app works fine for checking my home voice messages. Listening to voicemails is pretty straightforward. The transcription is useful. But I wish it had the ability to change the alert tone to something more significant. My biggest disappointment now is now they’ve taken away the ability to forward the voice message in an email. That was really useful. © 2017 AT&T Intellectual Property, Inc.